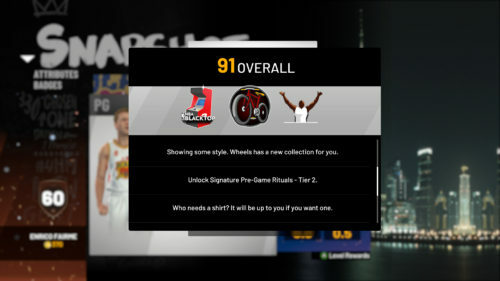 NBA 2K19 MyCarrer is a marvelous mode which you can create your player as you want and grind him from a rookie to a super star. The ultimate goal for your player is to reach rating 99 overall. Since you reach to 65, there are a number of level specific unlocks. Shirtless is one of these level specific unlocks. Head over to Doc’s to get your hair dyed. You will have the ability to perform Pre-game rituals. MyTEAM has something for you. Get a new ball. MyCOURT ball selections will be unlocked. You will be able to perform celebrations. Customizable jerseys will be available in the NBA Store. MyCOURT hoop options will be available. Mitchell & Ness gear will be available at the NBA Store. Unlock Signature Movement Animations – Tier 1. MyCOURT scoreboard customization will be available. New Era merchandise can now be found at the NBA Store. You have the ability to choose the jersey your team wears in NBA games. Game on! Footballs will be available at Swag’s Main Street Clothing. Custom MyCOURT floors will be available. Like bling? You will be able to wear custom jewelry. Only available at Swag’s Main Street Clothing. Customize arena sounds an intro music for NBA games. NBA murals will be available for your MyCOURT. It would be cool to ride a skateboard around the Neighborhood, huh? New boards available at Wheels. Ever wanted to sit in the GM seat for a bit? You will. Influence the way your NBA team operates, from plays to roster movement. Hoop it up at home. Unlock your own mini-basketball machine for your MyCOURT. Like bling? You will be able to wear custom eyewear. Only available at Swag’s Main Street Clothing. Are 2 wheels better than 4? Wheels has the answer. Take it to the streets. Unlock your own Blacktop arcade machine for your MyCOURT. Showing some style. Wheels has a new collection for you. Who needs a shirt? It will be up to you if you want one. Complete your look! Get your chest, back, and neck inked at Alley-Oops Tattoo. Unlock the Gym Rat Badge! No more gym workouts, and you will always have extra Energy (Turbo) available. Ever wanted to let the world know what you think? (Megaphone). Drop the beat. Unlock your own personal Beats Machine. Unlock Signature Celebrations – Tier 2. Get invited to the 2K VIP Club. Want to perform some tricks? Head over to wheels. Unlock the On Court Coach Badge! Call plays, tell teammates to shoot, and call for the ball. Unlock the ability to boost your Takeover abilities in your secondary archetype, or increase it for your primary if you’re pure. Get a head start on your next MyPLAYER! Why spin the wheel once, when you can spin it twice? Pay day! All games earn you double VC. Master of style. New ride available at Wheels. What’s better than a skateboard? How about one with no wheels (hoverboard). What’s the best way to rep your favorite team? Swag’s Main Street Clothing will know. You will be immortalized in NBA 2K20! Custom 2K Shoes and a copy of NBA 2K20 (limited supply).